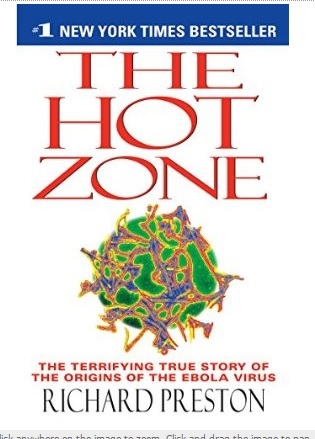 The Hot Zone–the ‘true story’ of a near Ebola outbreak in 1989, written by Richard Preston. Available on Amazon. I’ve been following the news about Ebola for about the past week or so. There’s much mis-information flying about. And (contrary to the assurances from Mayor De Blasio and friends), we are clearly not ready to face this in New York. Friday’s news photos of NYPD members dumping Ebola-exposed hazmat suits from Dr. Spencer’s apartment into a street-corner wastebasket confirm that such pronouncements are pure hopium. I am no doctor or epidemiologist. I am the simple artist. But I know when I’m being lied to. The reality is that we’ve been through a major Ebola scare, back in the late 1980’s. Richard Preston wrote about it at some length in The Hot Zone, a book that hit the Times Bestseller List around 1994. The big difference is that the Center for Disease Control was able to keep a lid on news of the possibility of massive infection back in 1989. The monkeys thought to be infected with the virus did not spread it to humans. And it was discovered that the virus lost virulence with each wave of infection in humans–the first infections were ‘slate wipers‘, but with each subsequent wave of exposures, the death rate dropped. And more than a few people with expertise in virology have tried to make the case that author Richard Preston overstated the infectious nature of Ebola. That said, the level of suspicion is understandable. Preston and others have written of the weaponization of biological threats such as smallpox and anthrax. If you’re a conspiracy theorist, you can see a scenario where the 1% want to wipe out as many humans as possible. They’ve already been vaccinated of course (assuming there is a vaccine). And even if the CDC has a vaccine developed by the end of the year, the drug companies surely won’t be able to manufacture more than a few million doses by the end of 2015–great news for those who can afford it, but of very little use to the 6,998,000,000 who won’t be able to bribe their way onto the A list. On the other hand, there seems to be a 21 day lag time between infection and symptoms. We now have an actual patient in the form of Dr. Craig Spencer.We know when his latent infection became active (October 23). We have a reasonable guess as to who was physically closest to him as he spread the disease via sputum, sweat or blood. Two weeks or so from now, we’ll know whether the world’s most famous Ebola patient is the Twenty First Century’s answer to Typhoid Mary. Meanwhile, in Africa where the disease started, the CDC has counted over 4,900 deaths from something like 10,000 reported cases. Which sounds like a lot (and it is, if you’re one of those people or related to one of those people). But here’s the thing: Ebola may or may not be a slate-wiping killer. We know that it kills upwards of half the people infected. But it isn’t clear that this will continue, and it isn’t clear that we’ll have more people in Africa getting infected once the medical establishment there understands the protocols. Meanwhile, some 100,000 people (most of them in the developing world) die EVERY WEEK from the effects of climate disruption. There’s some evidence that upwards of half those deaths are in Africa, where people living an already-precarious existence don’t have the wherewithal to survive years of crop failure or species decline. The death comes from a variety of causes– everything from flooding and destruction of cropland to starvation caused by drought. There are whole islands disappearing under the Pacific at the moment, and there is no plan for what to do with the refugees. Heck, we can’t even figure out what to do with the refugees from the drought in California. If you’ve read my blog before, you know that many of the people I’ve written about think that we may be looking at human extinction in a few decades. And you’d think that climate change issues would be a bigger issue. You’d think that if we’ve got 24/7 coverage and full-scale Obama bashing over a disease that may or may not be a threat, the ‘real’ news media would have their hair on fire over what is clearly an existential threat. NPR has just laid off its entire environment desk—they went from three reporters and one editor to one part-time staffer. A senior NPR Editor/spokescreature said something to the effect that that there were other issues of more interest and that she doesn’t feel the environment requires dedicated reporters because other staffers also cover it along with the regular beats. This is not long after NPR took a well-deserved slagging for its lack of coverage of the People’s Climate March in New York last month. More than one commentator has noted that the so-called public entities of PBS and NPR are beholden to big corporate interests for their funding. But the Main Stream isn’t doing much either–the Sunday ‘News shows’ barely mentioned the march or the issues raised by it on the day it happened. See, there’s something that can be done about the climate. There’s a political answer. It isn’t a magic bullet techno-fix, and it will require sacrifice by a variety of stake-holders. The stake-holders with the most to lose are the fossil fuel guys and their friends, who will need to leave trillions of dollars of oil under the sand if we’re going to have any hope of keeping carbon levels below extinction levels. And if you’re a news exec with 22 minutes of time to fill, it’s a whole lot easier to focus on a disease that has no villains (yet) than to kick some beehives and lose some money. As for PBS, they’ve had David Koch sitting on their boards of directors–they got freaked out when someone in their news tried to write a documentary about him. And NPR has decided that climate change isn’t a big deal, a decision that surely sits well with corporate donors. Meanwhile, their Ombudsman fights a rear-guard action to justify not covering the largest climate march in history. Ebola may or may not kill us. But climate change can (and probably will) end life on the planet. And (as I’ve posted before), the people in charge have decided not to tell us.